Estée Lauder believes that every woman can be beautiful, and beauty begins with radiant, well-balanced skin. Inspired by traditional Chinese Medicine philosophy, Estée Lauder launched its Nutritious Collection in 2007 to help women achieve healthy-looking, well-balanced skin. 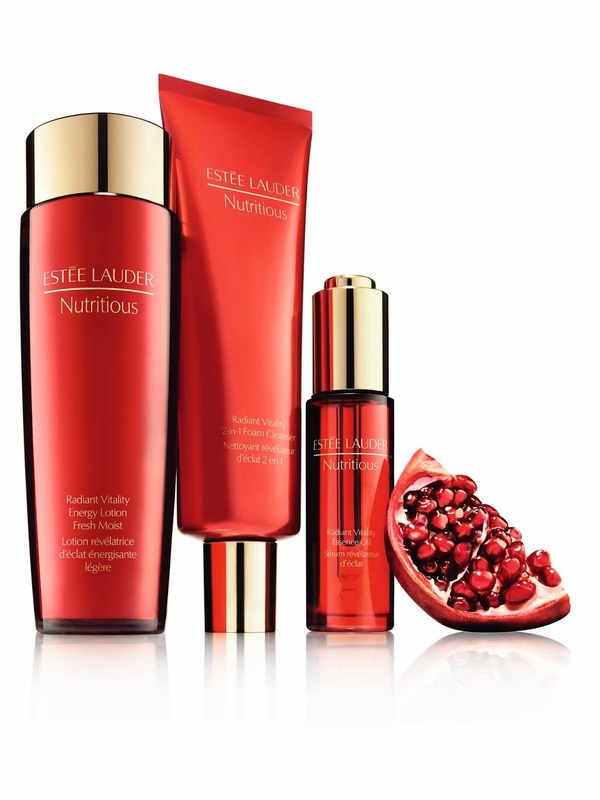 Now, Estée Lauder elevates the Pomegranate to the next level with NEW Nutritious Collection powered by the proprietary NEW Pomegranate Nectar Infusion. Recharging the look of skin with a daily dose of powerful vita-nutrients, moisture and energy, this new collection helps to reveal a virtual “post-exercise” glow. Almost like a “superfood” for skin, the collection features a highly potent Pomegranate Nectar Infusion combines a blend of bio-converted Pomegranate and anti-oxidant-rich super berries, and helpsdetoxify irritants, neutralize free radicals, and infuse skin with energy and vital nutrients. Bio-converted Pomegranate – The Pomegranate is one of the post nutrient-rich fruits ever discovered and Estée Lauder Scientists have long understood its super-potent anti-oxidant power to neutralize free radicals. 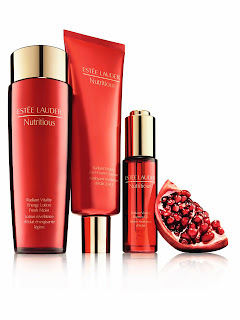 Now, Estée Lauder converts the Pomegranate into a form more readily absorbed by skin through a patent-pending, proprietary bio-fermentation process. This process helps to release the natural potency of the pomegranate, making it even more powerful and infusing skin with nutrients. Super berries – This potent blend of bio-fermented Cranberry, Blueberry and Wolfberry helps promote the activation of skin’s detoxifying enzymes to help defend skin against external stressors. Known as powerful anti-oxidants, Cranberry and Blueberry help to neutralize free radicals. Meanwhile, Wolfberry is known as an important Chinese herb that traditionally has been known to help enhance the absorption of nutrients. Nutritious helps skin recover its natural equilibrium by detoxifying irritants, neutralizing free radicals and infusing skin with energy and vital nutrients. DETOXIFY – Each day, impurities and toxins accumulate within skin’s surface layers helping preventing natural skin cell renewal and resulting in an unhealthy look. Nutritious works to support skin’s natural detoxification of these impurities and external stressors, leaving it calm and protected. NEUTRALIZE – By actively combating free radicals from environmental aggressors before they damage skin, Nutritious helps to improve skin’s natural defenses to create the appearance of healthy-looking skin. INFUSE – Nutritious infuses skin with the hydration and nutrients it needs to stay strong and radiant. Deep hydrators including Hyaluronic Acid and Glycerin help to replenish skin with vital moisture. NEW Pomegranate Nectar Infusion infuses skin with key vitamins and minerals to support skin’s natural energy. RADIANT VITALITY 2-IN-1 FOAM CLEANSER – Formulated with Pomegranate Nectar Infusion, this dual-action cleanser is the first step in the Nutritious regimen. It contains charged clay to help detoxify surface pollutants on skin, leaving skin thoroughly purified of dirt and makeup. Able to be used as both a daily cleanser and a purifying mask, it leaves skin purified with a supple, fresh and comfortable feel. RADIANT VITALITY ENERGY LOTION – This high-performance treatment lotion features Pomegranate Nectar Infusion and infuses skin with long-lasting hydration, vita-minerals and anti-oxidants while detoxifying skin of environmental aggressors. Available in the refreshing Intense Moist texture, this unique formula leaves skin prepared to absorb maximum benefits from the treatments that follow. Skin has a look of radiant vitality and a soft, supple feel. RADIANT VITALITY ESSENCE OIL – Like a “vitamin-booster”, this silky blend of nourishing oils helps to revitalize, fortify and protect the skin. Packed with the power of pure Pomegranate extract plus nourishing natural lipids and skin-essential Vitamin E, Radiant Vitality Essence Oil’s light texture absorbs instantly and helps to rebuild skin’s natural lipid barrier to help resist irritation and moisture loss. Skin is left feeling re-energized with a radiant, rosy glow and a softer, smoother feel. RADIANT VITALITY 2-STEP TREATMENT – Combining a Detoxifying Clay Mask with a Nutrient Infusing Gel Mask, this radiance-boosting, dual-action treatment helps to promote skin’s harmony and balance. It is empowered by the highly potent Pomegranate Nectar Infusion and includes hydrating Hyaluronic Acid. The clay mask deeply cleanses pores and surface impurities while the gel mask instantly replenishes and rebalances the skin’s moisture levels. Skin appears clearer, healthier and more radiant. NEW Nutritious Collection is suitable for all skin types, is Dermatologist tested, Non-Acnegenic and was specifically created for and tested on Asian skin. 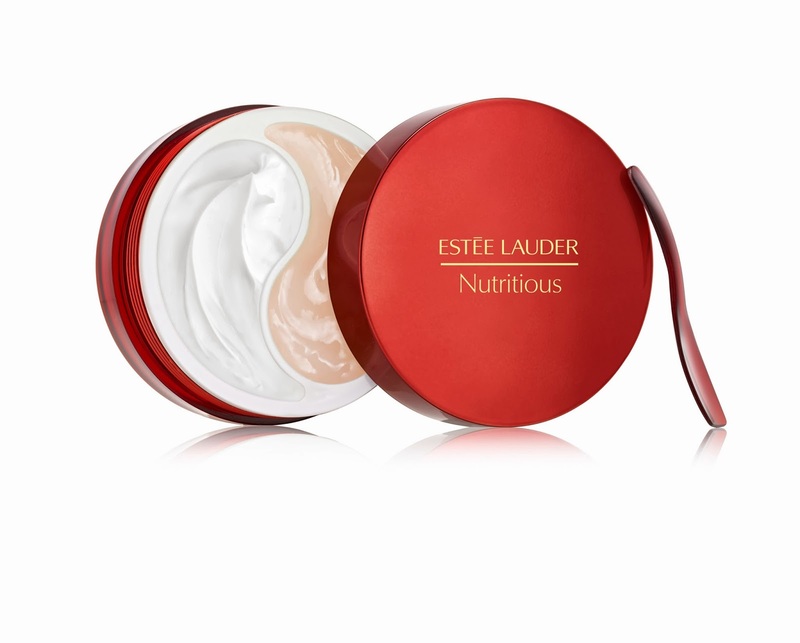 The New Nutritious Collection will be available from selected Estée Lauder counters nationwide and online at www.esteelauder.com.au from October 13, 2013.